Are you looking for a professional, affordable website design company? Does your existing website need redesigning? We provide quality web design, development and SEO services including advice on all website issues, from choosing a domain name (www. address) to website basics, designing, hosting and maintaining your website. Whilst we are located in Highams Park, East London, we also cover surrounding areas including Chingford E4, Walthamstow E17 and Ilford, South Woodford, Buckhurst Hill, Waltham Abbey and Loughton in Essex. We specialise in WordPress website design. Furthermore, all our websites are mobile and search engine friendly. We provide advice on how to promote your website and increase your search engine listing results. SEO, or search engine optimisation, is all about creating quality content, optimising it, and promoting it so that it can be found by people using search engines to find what they are looking for on the Internet. Search engine optimisation helps people to find you and your services and encourages users to visit your website. Your content is usually designed to encourage clients to take some action, such as to click a link, sign up for your newsletter, follow you on social media, or buy your product. Therefore compelling headlines and a persuasive call to action help you stand out in the search engine results. Social media is important for getting your clients to find you online. Having your website address in your social media profiles is one way of linking your social media to your website. Similarly, social share buttons and ‘Follow Us’ buttons on your website are a way that users and potential customers can connect with you. We can provide tailored social media training, help with creating a Facebook page, give advice on a social media strategy, and more. We want you to be completely satisfied with your website, so communication is important throughout. 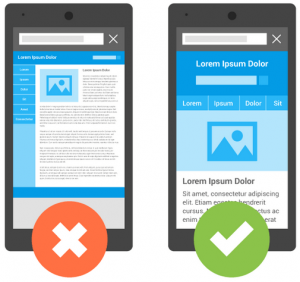 It is very important that your website is considered to be ‘mobile friendly’ by search engines such as Google so that it is listed in mobile search results. This tool tells you if your site is optimised properly for mobile devices and gives you recommendations to make your site better. What is the overall purpose of your website? To share information about a topic? To sell products or services? What content will you need to include? Testimonials? About us? What is relevant for the needs of your visitors? What will you include on your home page – a video introduction? product features? an ebook download? latest offers? Which are the important bits that you want people to be able to see without scrolling to find them? Here are some website design examples that Walker Websites have created. New rules mean that website owners need to know and inform users about what data they keep, how they use it, and allow for users to access that information or ask you to remove it. This video is a reminder that website owners need to consider the implications of using features such as contact forms, email or newsletter sign ups, analytics, shopping cart and membership logins on their website. We hope that you find this website useful. We have written articles on topics such as search engine optimisation tips, seo tools, seo checklist, website promotion, website health check, keyword research, WordPress web design tips, Ecommerce website considerations, backing up data, and more. Do you have a problem with your emails? Let us help – give us a call on 0777 169 1194. Contact us or telephone 0777 169 1194 for a chat, advice or a free no obligation website design quote. You have nothing to lose!